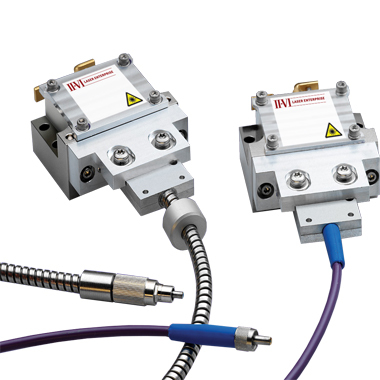 The II-VI Laser Enterprise BW series products consist of a diode laser bar packaged in a watertight housing, efficiently coupled to a small-diameter fiber bundle. This diode laser bar is a linear array of many individual emitters, fabricated on a single monolithic substrate for low power degradation and high reliability. ProLite BW diode lasers are coupled into a low-numericalaperture fiber bundle using proprietary lensing technology. The "bundle" construction — comprised of many single fibers — confines more power in a smaller cone angle to deliver a highintensity, high-brightness light source with very flexible delivery capabilities. With a simple, compact, and rugged design, the ProLite BW series products require no user maintenance or special handling, lowering the cost of ownership. The ProLite BW series also offers a wide variety of packaging options with different bundle lengths, jacket materials, connector types, aiming fiber options, and photodiode options for maximum end-user flexibility. The watertight package also enables customers to run the laser in high-humidity environments with high reliability and long lifetimes. Designed and built to meet specific customer requirements, ProLite BW diode lasers are built on the field-proven DCS heatsink platform that has demonstrated high reliability in thousands of hours of customer use.